Spain's 10 year spread to Germany hit another all-time high this morning. This is beginning to sound like a broken record, but there is something that's a little different. Usually the widening in Spain's spread would correspond to the euro weakening. But it looks like the euro has bottomed out, while Spain's spreads continue to march wider. 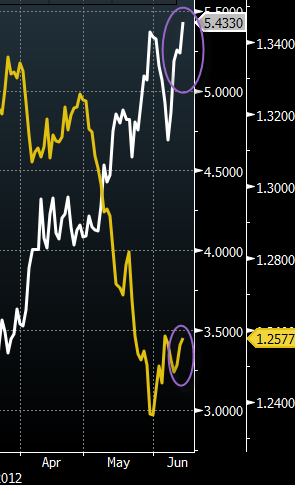 As discussed here, the EUR technicals are starting to play a role. The speculative component of the currency market is so short the euro, the relationships that have existed for some time no longer apply. This is likely a short-term effect, but it nevertheless can not be ignored.